Totally redesigned, the new 2014 Sierra 1500 gets better fuel economy while generating greater horsepower and torque, towing more weight, and carrying a heavier load. Free maintenance, new safety features, and upgraded in-cab technology underscore the dramatic upgrades made to GMC’s full-size truck. 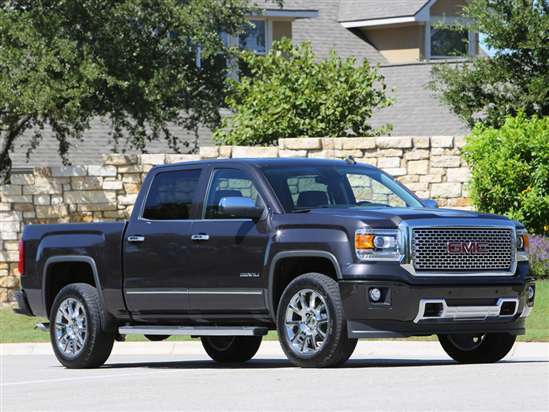 Like most big pickups, the 2014 Sierra 1500 is sold in an array of cab, cargo box, drivetrain, and trim combinations. Regular, Double, and Crew Cab styles are on sale, in base, SLE, SLT, and Denali trim levels. Key upgrades with SLE trim include nicer interior and exterior trim, aluminum wheels, IntelliLink Bluetooth connectivity, a reversing camera, and an EZ Lift tailgate design. The SLT includes a V-8 engine, trailering equipment, leather seats, dual-zone automatic climate control, and more. Sierra Denali models are luxuriously outfitted, and include navigation, a premium audio system, and a long list of extras. Sierra and Sierra SLE models are equipped with a standard 4.3-liter V-6 producing 285 horsepower at 5,300 rpm and 305 lb.-ft. of torque at 3,900 rpm. The V-6 tows up to 7,200 lbs. and can handle a payload as heavy as 2,108 lbs. The new 5.3-liter V-8 is expected to be a popular engine option for those trucks, and comes standard with SLT and Denali trim. Generating 355 horsepower at 5,600 rpm and 383 lb.-ft. of torque at 4,100 rpm, this engine totes up to 2,102 lbs. of payload or as much as 11,500 lbs. of trailer. A 6.2-liter V-8 is available for Double Cab and Crew Cab models, able to tow up to 12,000 lbs. and haul up to 1,944 lbs. thanks to 420 horsepower at 5,600 rpm and 460 lb.-ft. of torque at 4,100 rpm. A 6-speed automatic transmission with powertrain grade braking and a Tow/Haul mode is standard, and all three engines are E85-compatible. Active Fuel Management is also standard, shutting down half of the engine’s cylinders under certain conditions in order to conserve fuel. GMC also tosses in free scheduled maintenance for the first two years or 25,000 miles of ownership. As this vehicle summary is written, the EPA has only rated the 4.3-liter V-6 and 5.3-liter V-8 engines. With 2WD, the V-6 gets 20 mpg in combined driving, while the V-8 rates 19 mpg. With 4WD, the V-6 returns 19 mpg in combined driving, and the V-8 provides 18 mpg. The National Highway Traffic Safety Administration (NHTSA) gives the 2014 Sierra 1500 an overall crash-test rating of 5 stars, including 4-star rollover ratings for both 2WD and 4WD models. The Insurance Institute for Highway Safety (IIHS) has not tested the new Sierra as this summary is written. OnStar with Automatic Crash Response and FamilyLink service is standard equipment, with a free 6-month subscription upon purchase. All versions except the base model get a reversing camera and IntelliLink connectivity, and an optional Driver Alert Package contains parking sensors, Lane Departure Warning and Forward Collision Alert systems.